Situated in the scenic Jura region of eastern France, this stunning luxury camping site is in a picturesque location along the Ain River. 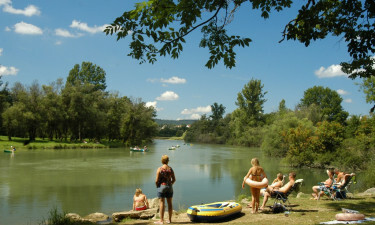 The five-hectare campground is close to Lake Vouglans, offering an unforgettable destination surrounded by nature. Whether you are staying in a mobile home or your tent, book your next camping holiday trip at this four-star campground with LuxCamp. 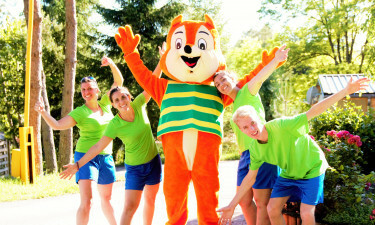 Why Choose Camping Le Moulin? This well-equipped holiday camping destination has its own weekly market and evening entertainment. You can also join fitness classes and sport tournaments, or enroll your children in a kids’ club. Wi-Fi access keeps you connected, while convenient laundry facilities are available on-site. There is also a snack bar and shop with essentials, and a bar with an inviting outdoor terrace. Camping Le Moulin’s exhilarating aquatic area has four pools, including a covered pool with a wading pool for kids. Outside, there is another swimming pool and wading pool along with three exhilarating water slides. You can also relax at the end of the day at the campground’s sauna. A multi-sports ground is perfect for football, basketball and other sports. There is also a volleyball pitch and table tennis, and playgrounds throughout the holiday camping site. You can swim or fish on the river the runs along the campground. Partners also organise various activities, from canoeing and kayaking, to climbing and trekking.